It doesn’t look like I’ll be swirling authentic Italian pasta around my fork in Italy anytime soon, so I’ve looked into making my own. After trying out a couple of methods, I can say for certain that anyone can make a very basic, very versatile pasta at home. The method is rather simple, but there are several different ways to make pasta, ranging from the types of flour you use to the shapes you cut it in to the type of dish you want to make. However, most start simply with whisking together flour and eggs. You can do this either on your counter by making a well in the flour and slowly incorporating the eggs from the center; or you can run mix the dough in a food processor. Then you’ll need to gradually roll the dough thinner and thinner. Once you’ve made your pasta, you can cook it right away, dry it or freeze it for later. When you do cook it, remember that homemade pasta cooks much more quickly than the dried pasta you buy. Give it about 3 to 5 minutes in salted boiling water, taste it, and keep checking in one-minute increments until the pasta is al dente (just tender). It’s a simple as that. Just like with most things worth doing, making your own pasta does take a little time, but it’s fresh flavor and tender noodles are well worth it! Enjoy! Read the full article and more at CitySocial.com or pick up an issue around town! Pulse flour in food processor twice to aerate the flour. Add the eggs and the salt. Run the processor until the dough is crumbly. Add 1 teaspoon of water while the processor is running. The dough should form a ball. If it is still crumbly, add 1 teaspoon more water. Remove the dough ball and knead for two or three minutes until smooth and pliable. Cover and let rest at room temperature for 30 minutes. After resting, cut the dough into four sections. Roll out the first section to about 1/4-inch thick. Crank the dough through the first setting of a pasta machine. Fold both ends toward the center like a letter. Run the pasta through the machine again, then fold again. Repeat this process at least 5 times. Now, move the setting to or the next setting up and run the pasta through, without folding this time. Then, move up to the next setting and so on and until your pasta is nice and thin and you have a strip of dough 2 or 3 feet long. Cut in half, then cut with a ravioli cutter or run through the pasta machine’s cutting attachment to make spaghetti or fettuccine. Drape of a pasta rack or the racks in your oven to dry up to 5 hours before storing or cooking. Cook in boiling water for about 3 to 5 minutes and serve with your favorite sauce. *I used Gold Medal “Better for Bread” flour to test. Heat the olive oil in a large skillet over medium-high heat. Toast the pine nuts for 4 to 5 minutes or until just lightly browned. Cook the spinach until fully wilted, about 3 to 5 minutes, season with sugar, salt and pepper. Let cool, then drain and dry the spinach to remove all the water. In a food processor, combine the toasted pine nuts, spinach and ricotta until it is the consistency of a fine paste. Whisk together the egg and water together in a small bowl. 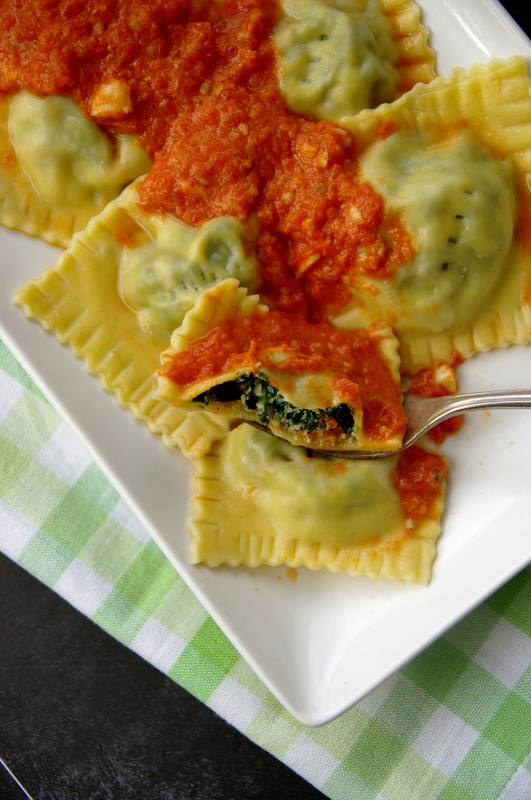 To assemble the ravioli, brush the egg over a sheet of pasta. Drop teaspoon-sized amounts of spinach mixture on the dough about one inch apart. Cover the filling with the top sheet of pasta, pressing out the air from around each portion of filling. Press firmly around the filling in whatever shape you wish and then cut them apart. Press the tines of a fork around the edges of the pasta to seal each. Fill a large pot with lightly salted water and bring to a rolling boil over high heat. Once the water is boiling, add the ravioli, stir gently, and return to a boil. Cook uncovered until the ravioli float to the top about 3 to 5 minutes. Serve hot with your favorite sauce. In a heavy, deep skillet, melt butter and olive oil over medium-high heat. Sautee the mushrooms and shallot until mushrooms are tender, about 5 to 8 minutes. Season with herbs (reduce measurements by half if using dried herbs). Add salt and pepper. 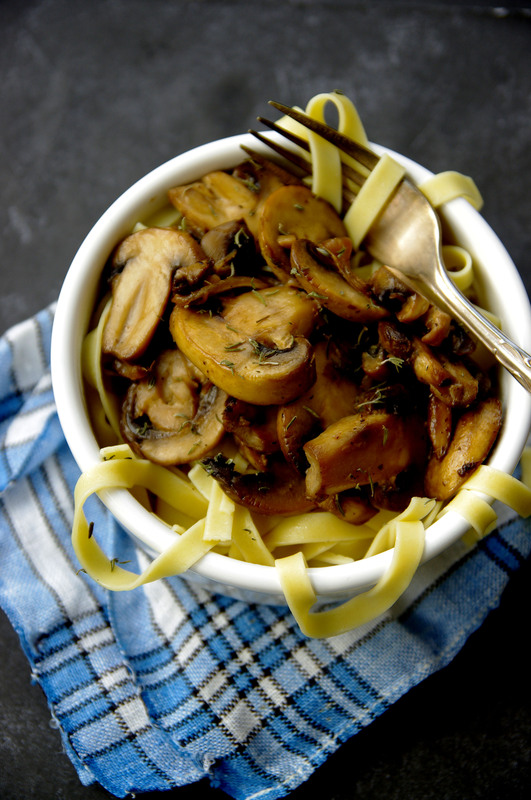 Pour in milk and stir to coat the mushrooms. Serve over freshly made pasta.